This brand of royal milk tea ranks pretty high up there among the list of Things I Miss About Japan. I would probably put it at the #4 spot. (Someday I should write a big ol' post about that.) After hot springs and mama-chari, of course, and definitely after Authentic Japanese Food. But it's way up there, and the worst part is, while it's not impossible to get Kochakaden here in Toronto, it is pretty prohibitively difficult. I started out by trying to find it locally. We have a nice selection of Asian supermarkets here, starting with the monolithic T&T and ending of course with Sanko, a mom-and-pop Japanese grocery that has been on Queen West since 1968. I hit more than a dozen stores in search of Kochakaden milk tea, to no avail. While many of them carried Kirin milk tea or other brands, none stocked the kind I sought. The gentleman at Sanko told me that it was likely because Coca-Cola Japan was very stringent with their imports outside the country. Next, I tried buying ready-made "milk tea" teabags purchased in Chinatown and at Lucky Moose. I tried Lipton first, but the Korean-made Lipton is vastly different from the Japanese one. 3:15pm Milk Tea is a good but too-sweet Korean alternative. 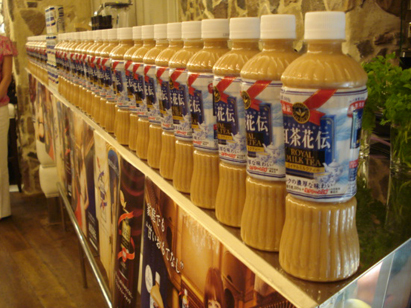 J-Town carried Japanese-made milk tea powder at one point, but they've been out of stock for some time. I decided to try brewing the tea myself. I started out with Darjeeling, as the Korean brand listed a darjeeling base. My friend Gai brought me home a bottle of Kochakaden from her trip to Japan, and I used it as a control group for my tea experiments. Myself and a friend who has a better sense of taste than me (he just completed bartender training) lined them up and tried them. I made a base recipe of 1/3 cup darjeeling tea (make sure it does not contain pekoe!) and a 1/2 tablespoon of simple syrup. First we tried evaporated milk. 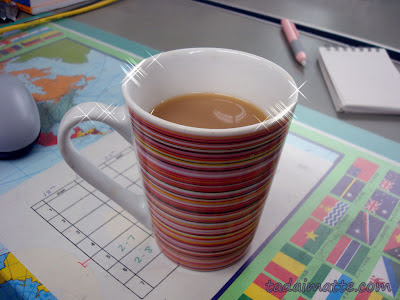 Its taste was quite dissimilar to Kochakaden, but very like my Korean milk tea. Next, we tried using 1 tbsp powdered skim milk. It was oversweet. Last, we tried a packet of Mini-Moo's half and half: it was just a touch too sweet, but definitely the closest. Matt suggested using unrefined sugar next time in my simple syrup. The follow day, after drinking the massive amount of brew we had made by turning it into bubble tea, I tried experimenting with English Breakfast. It wasn't quite right - I'm going to try Twinings next time. Matt's recommendation was Uva tea or a Ceylon, possibly Assam. I tried Earl Grey next, as I didn't have Uva/Ceylon/Assam in the house. I went with 1/3 cup tea, 1/2 tbsp simple syrup and 1/2 tbsp half-and-half. It was closer, but still too sweet. Assam. 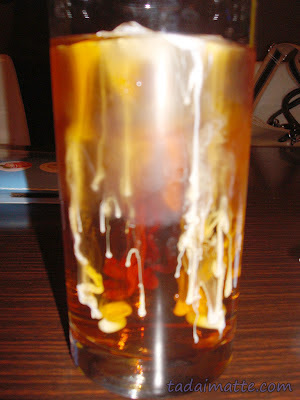 1/3 cup tea, 1/2 tbsp 1:1 simple syrup, 1/2 tbsp half-and-half. Brewed the tea too weak. I used 1 teacup of Assam to 1 tsp tea and steeped 3.5 minutes. Might try Assam again sometime, but I'll use 1 1/4 tsp to a cup, and steep 4 minutes minimum. I went back to Earl Grey. This time, 1/3 cup tea, 1/2 tbsp sugar syrup, 1 tsp half and half. This seems like the closest proportions yet - I could have served it in a cafe, but it still wasn't Kochakaden. I despaired of ever figuring out what gives Kocha that floral taste. In the end, I bought a case of Kocha from Rakuten for a mere ¥3,062. I was on the Tenso.com mailing list, and they are a proxy receiving company for Japanese goods. They advertised a coupon whereby you could get up to ¥5,000 international shipping for ¥1,000 - in other words, ¥4,000 off the cost of shipping a heavy item. Like a box of 24 drinks. So I paid ¥3,845 for the cost of the drinks and the shipping from Rakuten to Tenso, and waited for the estimate from them on what the final cost would be. I got the quote a few days later - shipping by EMS (the quickest and default mailing system Tenso offers) would be ¥17,300. Ha ha ha! No. I sent an inquiry as to whether they could send this heavy item by seamail. Luckily for me, they could do surface. The cost before my coupon would be ¥7,800, and after the coupon the bill would be ¥3,800 plus the handling fee. The handling fee was ¥2,980, as the package was between 10 and 20 kilograms. I would have my tea in less than two months. In the end my total cost was equal to about $140.62 Canadian dollars. Oh. So I'm paying about $5.85 per bottle of tea. Beautiful, beautiful milk tea in the motherland. Sometimes, though, people are willing to put a lot of money toward having a good experience! I'd pay six bucks at a bar for a cocktail. Why shouldn't I pay six bucks to have a plastic bottle of tea at home...right?